The vast landscape bordering the western piedmont of North Carolina rolls unobstructed across the horizon towards the eastern wall of the Blue Ridge Mountains. Wave upon wave of foothills caress the lower mountain slopes of this ancient barrier wall, drawing ever so grandly towards a dramatic peak along the rugged mountain's crest. Western North Carolina's Rutherford County is cradled here in this diverse landscape offering high mountain adventure, a scenic mountain lake fitting a Hollywood backdrop, spacious meadowlands and the serene foothill country of the eastern Blue Ridge Mountain range. The folks living in the towns and communities within Rutherford County not only cherish their homelands' natural beauty and rich heritage, they gladly welcome visitors and new residents to join them for fun, recreation, live entertainment, cultural heritage and so much more. During the Blue Ridge Highlander's many trips to the area we felt a genuine hometown hospitality everywhere we ventured throughout these beautiful foothills and mountain lands. Rutherford County is one of Western North Carolina's most popular vacation destinations. Here you will find unique natural wonders, rugged mountains, defining foothills, vast meadowlands, and beautiful waterways awaiting your arrival. During our journey we found a variety of lodging from private and secluded cabin rentals, unique bed and breakfasts inns to popular resorts and spas. Whatever your lodging preference, you will find what you are looking for here in these majestic Blue Ridge Mountains and Foothills. Towns like Rutherfordton, Forest City and Spindale along with the smaller communities in the surrounding countryside offer a personal glimpse into what true blue rural America is all about...a slower pace, less stress and friendly folks. As a travel destination, resort towns such as Lake Lure and Chimney Rock Village along with the mountainous regions of Golden Valley in northeastern Rutherford County, offer comfort, luxury, convenience and seclusion in a setting of natural wonders. Local and outlying residential and upscale communities have all the amenities needed to make Rutherford County an excellent choice for a 2nd home, retirement or relocation. Today, this land of natural wonders is fondly referred to as "Lake Lure and the Blue Ridge Foothills," a fitting name for the locals who cherish their county's farmlands and waterways as well as their majestic mountain and hill country. The county is best known for Chimney Rock at Chimney Rock State Park and the picturesque clear blue waters of Lake Lure, although there is so much more to Rutherford County you'll want to become acquainted with. Quaint historical towns throughout the northern mountain and valley country of Rutherford County including Golden Valley, offer a very special and insightful addition to the county's rich heritage and beauty. The larger towns and other communities of Rutherford County offer an array of activities including an outdoor concert venue, a new minor league baseball team, a premier women's clothing outlet, museums, live entertainment, theaters and numerous event and festivals throughout the year. Come for the views discover infinite possibilities - is the natural fulfillment of your trip to the North Carolina mountains. Take a deep breath of refreshing mountain air, become invigorated by our hiking trails, and let your cares fade away in the cool mist of Hickory Nut Falls. The perfect place to reconnect with nature and spend time with family and friends. Only minutes from Lake Lure, Chimney Rock offers the best of the mountains in one place – spectacular 75-mile views, hiking trails for all ages, a 404-foot waterfall and signature special events. 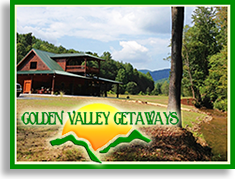 Golden Valley Getaways in Golden Valley North Carolina Featured in USA Today ! "Peaceful, private and relaxing" describes our selection of impressive vacation home and log cabin accommodations in the Blue Ridge Mountains of North Carolina. Our getaway destination have gorgeous mountain views. Located between Hickory and Asheville, 15 miles south of I-40 on NC Scenic Byway, Route 226, in the Beautiful Blue Ridge Mountains, our cabins are within minutes of many of North Carolina's most visited mountain attractions. Should you choose Sunrise Mountain Cabin for your mountain getaway, you will enjoy a luxury cabin with all the comfort of home and a million-dollar view with privacy and seclusion, and no neighbors in sight. We all tend to get caught up in the stress of our everyday lives, and without an escape from that stress, life loses its true meaning. A trip to the mountains will help you put life in perspective. We named our cabin Sunrise, because of the outstanding morning skies. Each morning you will see a new nature made painting from the front deck that will rejuvenate you. Should you choose Sunset Mountain Lodge for your mountain getaway, you will enjoy a luxury cabin with all the comfort of home, a million-dollar view with privacy, seclusion, and no neighbors in sight. We all tend to get caught up in the stress of our everyday lives, and without an escape from that stress, life loses its true meaning. A trip to the mountains will help you put life in perspective. We named our cabin Sunset Lodge, because of the outstanding evening view. Each evening you will see a new, nature made painting from the front deck that will warm your soul. Horizons on Yellowtop Mountain is a quiet, private and secluded luxury cabin in a Golden Valley North Carolina gated community. When visiting Horizons you will find a peaceful community in the Blue Ridge Mountains, with nature's beauty at every turn, and no neighbors in sight. You will enjoy this luxury mountain getaway, with all their the modern amenities. Because of its high elevations, you will experience cooler summer climates with a breathtaking scenic view of Golden Valley and Sunshine, North Carolina. Should you choose Mountain Vista Cabin for your mountain getaway, you will enjoy a cabin with all the comforts of home and an incredible view, not to mention privacy and seclusion. We all tend to get caught up in the stress of our everyday lives, and without an escape from that stress, life loses its true meaning. A trip to the mountains will help you put life in perspective. We named our cabin Mountain Vista, because of the outstanding mountain skies. Each morning you will see a new nature made painting from the front deck that will melt your stress away.